Working moms face multiple financial dilemmas and it can be tough navigating those waters. Fortunately, we have Bobbi Rebell to share with us the financial challenges she encountered and what she has done overcome them. Bobbi grew up in suburban New Jersey. Her father worked on Wall Street, and her mother was a lawyer. Her mother had originally started as a full-time volunteer at a law firm, and her father had mentioned that she should be getting paid for all the hard work she was doing. So, Bobbi’s mother went to law school and got her degree. Bobbi started her first job at age 15 as a bakery counter girl. Her job involved dealing with money and memorizing all of the prices for each baked good. Bobbi’s parents raised her with the mentality to always work, and to work well. Once she was old enough to have spending money, specifically in college, her father would make her plan out and budget her semester (other than tuition). She had to think about everything, including books, food, and rent. So long as she could justify the money she needed from him, he would give it to her. Bobbi found it difficult to determine how much she needed, especially during her sophomore year when she moved out of a dorm and into an apartment. She had not taken into account the bills for basic household goods. It was a good life lesson, since if she didn’t have enough she would need to make sacrifices, or work a little more. She never went back to her father for more money, She always figured it out herself. This was a good lesson for her. Bobbi was always very shy in high school. To help her get out of her shell, father insisted she join the debate team. At first, she was too scared to open up, but she quickly realized that she was rather good at debates. It was when she beat the best debater in her school and became president of the team that she realized just how good she was. She had grown an interest in journalism during her debating years. Her father, however, knowing that journalism did not pay very well, asked that she work on Wall Street with him. As a compromise, Bobbi sought out internships with business news channels. At the time it was very difficult to find an internship that paid, so she settled with one at CNN. This way she could learn about news, but also gain knowledge on stocks and Wall Street Business. Due to the high level of interns, Bobbi was not getting paid and found herself struggling to get the best assignments. That’s when she decided to work on the night shift. There, Bobbi wrote scripts that aired, and once she graduated from college, she was able to get her job at CNBC. Bobbi’s first marriage started in her mid-twenties and ended by her thirties. When she first got married, Bobbi envisioned herself taking the back seat in making money so she could spend more time taking care of the kids. The issue was her and her husband (at the time) were not on the same page regarding money. When they were dating things were always good financially, so they never had to deal with difficulties. After their marriage, her husband’s job was eliminated, so he tried to pursue his dream of entrepreneurship… but it wasn’t working. Bobbi quickly became the breadwinner of the household. Bobbi wanted financial stability before they had kids since she thought it was important. But since her husband’s efforts were not working for him, he felt defeated, and the financial tension grew, and things did not work out. Contrarily, Bobbi and her current husband actively spoke about money before their marriage, and they figured out what to prioritize. They wanted to bring up their kids with a knowledge of money. Because they were on the same page, they were able to get through the tough times. After becoming a mom, Bobbi realized she did not like the limited time she got to spend with her ten-year-old son after coming home from work. So she made the change and became an at home entrepreneur. Bobbi was going to get a workspace, but she realized she worked really well from home; she compartmentalized her work on specific days and organized her appointments. Despite this, Bobbi quickly realized that she needed to make peace with needing childcare and frozen dinners once-in-a-while when she just did not have the time. It allowed Bobbi to have better quality time with her son in the end. As a working mom, Bobbi stresses the importance of taking care of yourself, even when trying to care for others. It is important to be clear about your priorities. Bobbi did not want to come home tired and have only twenty minutes with her son before having to make dinner. She realized that using childcare did not mean she was a bad mother. Even if she worked at home, it was still a real job, and if Bobbi needed to hire childcare to be better at her job and motherhood, then that was ok. 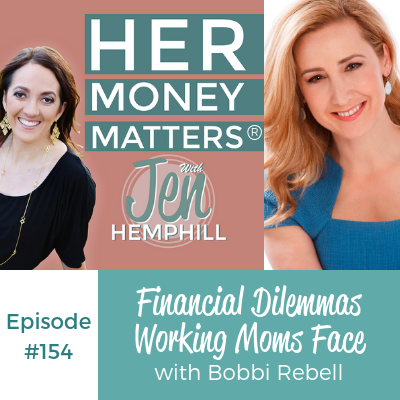 The post, Financial Dilemmas Working Moms Face with Bobbi Rebell appeared first on the Her Money Matters Podcast.